* The original N95 (a.k.a. N95-1, a.k.a. RM-159) targeted mainly the European and Asian markets; while it had quad-band GSM (2G) support for use in nearly every country, including the USA, it had support only for the international W-CDMA (UMTS/HSDPA, a.k.a. 3G/3.5G) frequency (commonly referred to as UMTS-2100). Nonetheless, this phone was later made available for retail in the USA as well, through Nokia's flagship stores, online site, and 3rd party retailers. It had manual shutter lens protection (you would slide it open to start the camera), 64MB of runtime/dynamic memory (RAM), and a 900 mAh battery. Common complaints about this phone was that it would often run out of memory when several applications were open, and that the battery life was too short. * The N95-2 (a.k.a. "N95 8GB", a.k.a. RM-320) increased the screen size from 2.6" to 2.8" (diagonal), increased RAM from 64MB to 128MB, increased the battery size from 900 mAh to 1200 mAh, removed the slider mechanism for opening the camera lens, replaced the µSDHC card slot with 8GB of internal flash, and replaced the silver faceplate with an all-black design. However, the bands supported were the same: W-CDMA 2100MHz, GSM 850/900/1800/1900 MHz - so although it will work fine with both AT&T Wireless, T-Mobile USA and Rogers, it does not support 3G/3.5G network speeds in North America. Nonetheless, as with the N95-1, Nokia has sold this phone in North America as well until just a few weeks ago; so possibly, this is the phone sold here (Unfortunately, Nokia's own sales channels do not normally make this distinction, and Amazon's product description is also somewhat lacking). * The N95-3 (a.k.a. "N95 NAM", RM-160) is the first model targeted for North America. Most of the exterior design is similar to the N95-1 (Silver faceplate, 2.6" screen, µSDHC slot), but like the N95-2, it has 128MB of RAM, a 1200 mAh battery, and no manual slider for the camera shutter. The main reason for its existence is that it swapped the original UMTS-2100 (WCDMA) frequency for UMTS-850 and UMTS-1900, so that it would work with AT&T Wireless's 3G/3.5G network. Until just a few days/weeks ago, this would have been the "best" choice for US customers. * The N95-4 (a.k.a. "N95 8GB NAM", RM-421) is identical to the N95-2, except that like the N95-3, it swaps UMTS-2100 for UMTS-850/1900. 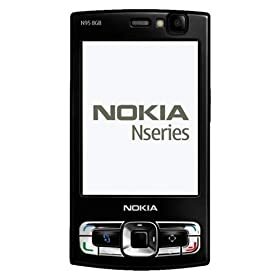 It was released just a couple of weeks ago, though, so if Amazon got their inventory of "n95 8gb" devices from Nokia prior to this, it would have been the N95-2 rather than the N95-4. (The exterior and labeling of both is the same). Also, the firmware revision numbers are different, so some utilities (like the "Nokia Multimedia Transfer" application and iSync plugin for Mac OS X) do not yet recognize this phone.